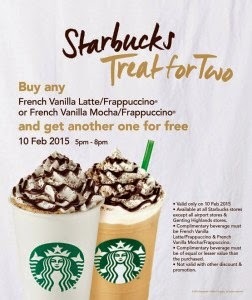 Starbucks Malaysia is offering Buy 1 FREE 1 Promotion for Vanilla Latte / Frappuccino or French Vanilla Mocha / Frappuccino on 10 February 2015, 5pm – 8pm. Terms and conditions apply, available while stock last. Starbucks purchases and roasts high-quality whole bean coffees and sells them along with fresh, rich-brewed, Italian style espresso beverages, a variety of pastries and confections, and coffee-related accessories and equipment – primarily through its company-operated retail stores.